Creedence Clearwater Revival, also referred to as Creedence or simply as CCR, gained popularity in the late 1960s and early 1970s. 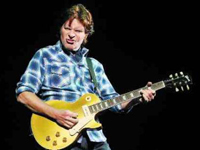 The group consisted of singer, lead guitarist, and primary writer John Fogerty, rhythm guitarist Tom Fogerty, bass player Stu Cook, and drummer Doug Clifford. Their roots were in California but the sound they delivered was southern, swamp music. John Fogerty, Doug Clifford, and Stu Cook (all born 1945) met at junior high school in El Cerrito, California and began playing music together under the name “The Blue Velvets.” The trio also used Tom Fogerty, John’s older brother, at live gigs and in the recording studio. By 1964, the band had a contract with Fantasy Records. Fantasy’s co-owner Max Weiss renamed the group “The Golliwogs” for the band’s first release. “The Golliwogs” put out seven singles but none received national attention. 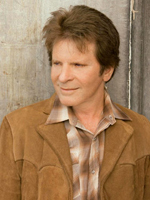 In 1965, John Fogerty and Doug Clifford were drafted. Fogerty enlisted in the Army Reserves instead of the regular Army and Clifford did a short tenure in the Coast Guard Reserves. Fantasy Records was sold in 1967 to Saul Zaentz who offered the band an opportunity to record a LP if they would change their name. Creedence Clearwater Revival was born. The band took the three elements of their name from Creedence Nuball, a friend of Tom Fogerty; “clear water,” from a television commercial for Olympia beer; and revival, which spoke to the four members’ renewed commitment to their band. When Fogerty and Clifford were discharged form the military in 1968, the band devoted their full time attention to playing local clubs. This is also the year their debut album “Creedence Clearwater Revival” was released. Included on the album was a remake of a 1956 hit, “Suzie Q” that became the band’s first single to make it to the Top 40. It was the only hit CCR would have not written by John Fogerty. CCR released three albums during 1969 cementing their success in the rock world. Their second album “Bayou County” was released in January 1969. Included on the album was the song “Proud Mary” which reached #2 on the Billboard chart and would later be remade into a 1971 hit by Ike and Tina Turner. In fact, “Proud Mary” has been remade by other artists some 100 times. In August 1969, the band’s third album “Green River” was released and quickly went to gold. Then in November 1969, their fourth album, “Willy and the Poor Boys” was released. Included in this album were the songs “Down on the Corner” and “Fortunate Son” which reached #3 and #14 respectively on the charts. In 1970, the band recorded its Saturday, January 31 live performance at the Coliseum in Oakland, California, which would later become a well-known live album and television special. By February, the unstoppable Creedence was featured on the cover of Rolling Stone. 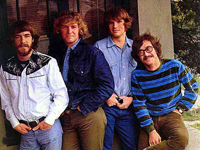 In April, 1970, CCR began its first European tour. The band returned to California in June and recorded their fifth album, “Cosmo’s Factory” which was released in July 1970. The album was Creedence’s best seller and went straight to #1 on the Pop charts and #11 on Billboard’s Soul Albums chart. Their sixth album “Pendulum” was released in December and was another top seller. Even with all the success of CCR, differences arose among the members and in February 1971, Tom Fogerty left CCR to pursue a solo career. John Fogerty, Cook, and Clifford continued but despite their continued success, their relationship was strained. 1971 came and went without CCR releasing a new album. CCR’s seventh and final album “Mardi Gras” was released in April 1972 without Tom Fogerty. It peaked at #12 but received the worst reviews of any of their albums. Just after its released, CCR began a spring and summer tour of the United Stated, Australia, and Japan. It was their last tour. On October 16, 1972, the band officially announced that Creedence Clearwater Revival’s reign was over.